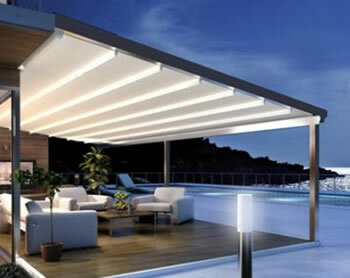 Retractable roof awnings are a concertina style retractable roof or pergola awning that fold the fabric back in pleats when retracted. Our retractable roof systems are engineered to withstand wind speeds of up to 117km/hr (W32). 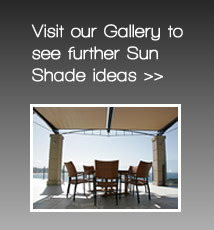 Create an outdoor room for all seasons with optimum protection from sun and rain. The advantage of a retractable roof over a louvre style roof such as the Vergola is that the retractable roof can be completely opened. The Vergola style louvered roof can only tilt the louvres to different angles. Aluminium frame Powder coated in any of over 100 Dulux powder coat colours. PVC architectural membrane offers outstanding UV stability and mechanical strength. A range of frame options or can be integrated into an existing structure. Commercial or residential applications, decks, patios, cafes, restaurants and clubs. Width of up to 4.5m between tracks and maximum width of 20m in one membrane. European design manufactured in Sydney. 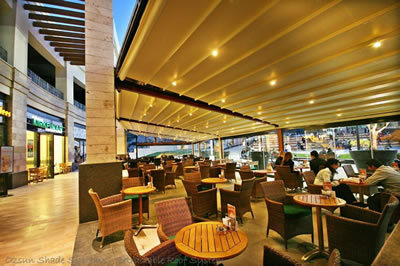 We offer 2 retractable roof systems; the All Seasons Designer and the Oztech Series. One of the features that differentiate the Designer retractable roof system from our Oztech system is the finish. The Oztech system is made with exposed key ways (grooves) on the aluminium rafters and posts that make it a very economical system to assemble and install. The All Seasons Designer system has a more contemporary appearance. The extrusions are made with a unique double internal chamber so that the key ways and bolts are hidden from view giving the extrusions very streamlined appearance.